Probably the most comfortable small dog harness on the market! - Tired of dog harnesses that your dog hates and are difficult to put on? - Hate those clunky hooks and straps that choke your best friend? - Looking for safe and comfortable dog harness that looks good and is durable as well? Our small dog harness is made out of Metric 66 which is a lightweight, breathable and washable material which embraces your small dog's delicate curvature. We encourage you to try one of our soft dog harnesses today and see for yourself how your small dog loves it! If, For Whatever Reason, You Don't Absolutely Love Your Dog Harness,Just Return It And We'll Cheerfully Refund Every Cent! WE CANNOT GUARANTEE THIS SPECIAL PRICING FOR LONG SO ACT FAST! Our dog harness is extremely comfortable for most dogs, it is made of the same material we use to make women's bra cups, and should work very well even for sensitive dogs. However, some dogs have very sensitive skin and or the harness does not fit them properly, so please check frequently to be sure that your dog does not have any irritation when wearing the harness. We love dogs as much as you do, and if for any reason our harness does not feel great on your dog, we encourge you to return it for a fill refund. 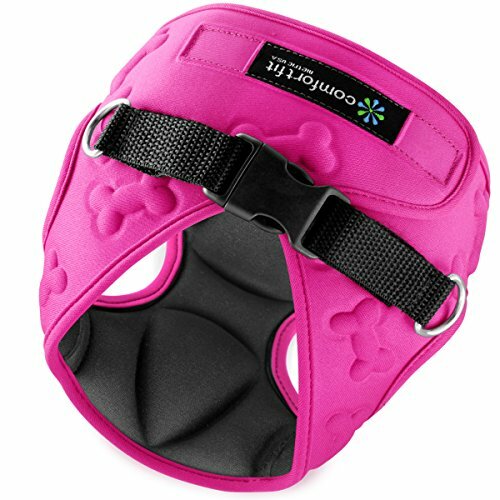 Small Harness fits a dog with a Chest Girth of 15"- 17"
If you have any questions about this product by Comfort Fit Metric USA, contact us by completing and submitting the form below. If you are looking for a specif part number, please include it with your message.